distributed control systems. Graphical function blocks are linked by drag 'n' drop connections to build your control scheme. A signal flow diagram option displays your system configuration in a clear, easy-to-navigate format with access to every parameter, drive and device and provides concise project documentation. are all automatically updated online. "phantoms" to create systems which can be downloaded later into the real devices. can be downloaded free of charge from driveweb.com and provides powerful navigation features including pan, zoom, jump to, drill down, and browse. Low cost full featured Distributed Control capability with peer-to-peer networking. 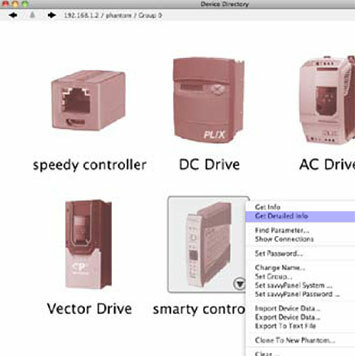 "drag & drop" techniques make easy parameter connections between drives, control devices, etc. Password protection is provided for savvy software, speedy and smarty devices. 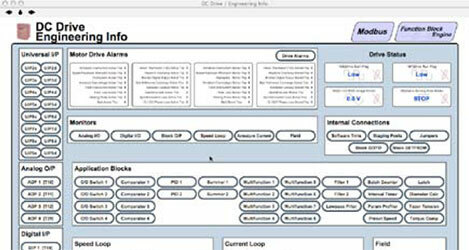 In complex products with a fixed set of features, such as drives, an Engineering Info window gives an organized overview of the key parameters, i/o and control features. You can collect any parameters of interest in a “dock” window and display as a trend chart. The trend time scale can be adjusted from 10 seconds to two days and the data can be exported in a .csv format for separate spreadsheet analysis. Click on a point of interest to get the instantaneous, time stamped data values. Information is at your fingertips wherever you are in savvy. The full user manual is built into the tools and is only a click away! Right click on any device or parameter icon and an information/features window will open to give you access to a wide array of details and action options. A “hover text” feature displays supplementary information as the cursor passes over an object parameter or link. Pop-up “tool tips” messages remind you of the function of button icons. connections between parameters in any device are easily made by “dragging and dropping” the “from” parameter icon onto the “to” icon. Simply pass the cursor over the blue connection arrow to show the source or destination. Click on a connection arrow to jump directly to the other end of the link. built-in rules checker ensures that you avoid making invalid connections. The savvy-SFD option provides a powerful, graphical, Signal Flow Diagram interface with enhanced system wide navigation and the ability to produce clear, annotated, device and system documentation. Basic savvyPanel operator station functions included. Create your own customized drawing sheets with choice of ISO or ANSI formats. 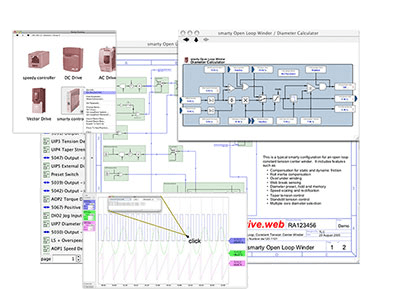 Signal flow diagrams provide a clear vision of your control scheme and its functionality. Tags clearly specify the source, destination and location of connections between multiple pages. Entire drawing is stored in the drive.web devices for instant access in the field. Key parameters can be shown at the Signal Flow Diagram level for enhanced monitoring and control. Connections are “rubber-banded” so function blocks can be moved on pages or between pages. 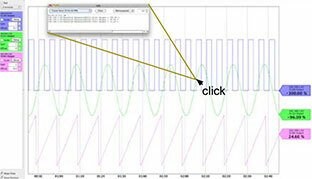 “Drag & drop” connections can be made between any parameter anywhere in a system. Drawings can be user annotated. Powerful navigation features ensure fast searches and guarantee that you will never get lost. To the right are the first two pages of a typical open loop constant tension center winder configuration in a smarty. Clicking on a function block in the Signal Flow Diagram drills you down into the details and shows parameter values and status. Function blocks and connections are shown in a list that can be sorted and filtered to show objects with common attributes or states. The lower page shows how function blocks can be organized in a logical signal flow manner that makes system design and user comprehension very easy. The entire drawing data is stored in the drive.web smarty or speedy and can be accessed at any time without the need for externally stored configuration files. savvy-SFD automatically produces top quality documentation as you design, configure and build your system. Open the “File” menu in the basic savvy, select “Demo Mode”, check the “Graphical Configurator” box and follow the “Getting started with savvy-SFD” guide in the “Help” menu. With your computer connected to the Internet, start the drive.web savvy program and either use an Option Coupon, which you can obtain from your distributor, or process a credit card transaction. The savvy program incorporates several very useful documents in the “Help” menu that introduce you to the basics, guide you through the details and help you plan, implement and document your system designs. savvy is a very powerful drive, systems design and configuration tool. We offer both introductory and advanced training courses that will help you get the most out of your projects. For details, please call us at (410) 604-3400.